Vidal: I just want to do right, sir. Vidal: Be a good soldier. Help these people. Alonso: Obey orders. That's all you have to do. As a young soldier helps rebuild a worn-torn country, he is facing his own inner turmoil. While Private Vidal (Eloy Azorin) applies plaster to a bomb-ridden structure, he sees another atrocity about to take place: a civilian is dragged through the streets, surrounded by a group of thugs clearly set on killing the innocent man. Vidal does not wish to stand by any longer. Despite the orders of his superiors, he gears up and runs off on a near-suicidal mission to help the man, pulling in the rest of his platoon. Is Vidal a rebel, looking to simply stand out from the crowd; a foolish noble, looking to remedy a seemingly hopeless situation, or the only sane one in country? 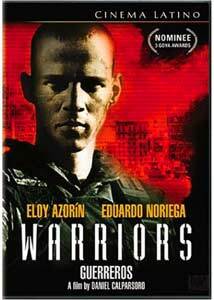 Daniel Calparsoro's Warriors (Guerreros) begins with this struggle, seen all too often by soldiers in foreign lands. Set in Kosovo following the chilling genocide that took place there, the film follows a platoon of Spanish soldiers who get caught between two cultures bent on each other's destruction. Things begin with routine, laid out by the platoon's by-the-book Lieutenant (Eduardo Noriega). Indeed, following orders is seemingly paramount in such an environment, but how can one stand by and let innocents die when action can be taken? Vidal is the standout among the troops, though it is unclear whether he is trying to be a hero, or to simply get a ticket home. His conduct mirrors Colin Farrell's Private Bozz in Joel Schumacher's superb Tigerland. This is no superb tale, though. When the platoon is sent to restore electricity to an entire valley, they first encounter a group of militant Albanians, who refuse to disarm. Battle breaks out, Spanish, French and Italian soldiers are killed, and the survivors scatter. From here on out, it is a game of survival, peppered with violent encounters with more Albanians, militant Serbs, and unnamed fragments in between. Clearly, both sides believe the Europeans are aiding their enemies, thrusting the soldiers into brutal captivity, violence, and eventually, all out savagery. Warriors is a unique piece of work that doesn't quite come together. The film seems to hop between genres, at times feeling like a serious war drama, a cheap action picture, and even an all-out horror film in the vein of 28 Days Later. It resembles a Spanish-language Bruckheimer film, complete with a sleek, dazzling visual style, characterized by constant use of a 45 degree shutter (made popular in Saving Private Ryan), giving the action on screen a crisp, staccato look that provides a welcome sense of immediacy and realism. Cinematographic strengths aside, the material is thin. Characters are relatively nonexistent here, resorting to flat characterizations that fit into the usual war film clich�s. Beginning with a focus on Vidal, the film tends to shift focus to other individuals, not fully developing a clear arc for the private, who, for some inexplicable reason, suddenly goes insane in the third act. The script begins to hint at larger moral issues, and contains some powerful, if overly violent sequences, but in the end, amounts to little more than cotton candy�you think you may have something, then it dissolves. Despite these drawbacks, the great visual style coupled with a solid musical score makes this watchable, but don't look for anything deeper. Image Transfer Review: Fox's transfer is excellent, showcasing Josep M. Civit's strong cinematography. Much of the film is quite dark, yet color, contrast and shadow detail are solid. The print shows some minor grain and the occasional fleck of damage, but it is minimal. There is some edge enhancement to deal with from time to time, mostly around titles. Audio Transfer Review: Unfortunately, no 5.1 track is included, which is odd for such a recent film. Still, the provided Dolby Surround track shows good fidelity with some strong bass, supporting the musical score very well. Sound design is solid, especially during a sequence that takes place within an armored personnel vehicle that is being pummeled by rocks. Channel separation is impressive, but a discrete 5.1 treatment would have made all the difference. An English stereo track is provided, but stick with the original language. Extras Review: The disc includes no extras whatsoever. Images on the back cover give the impression that this is some kind of zombie movie. At times, it's not far from the truth. Daniel Calparsoro's visually stunning film does not delve deeply into character or plot. This film has potential, but needs a massive script overhaul. Nevertheless, Fox should be commended for continuing their Cinema Latino line, which brings these recent films to a wider audience with fine a/v quality.